This tutorial explains how to show Dropbox photos as desktop wallpaper in Windows 10. You will be able to select any folder available in your Dropbox account and set photos from that as desktop wallpaper. Apart from this, you can set the time to automatically change the wallpaper so that you can view all Dropbox photos of that particular folder one after another as desktop wallpaper. You will also be able to set the picture mode. That means you can set if you want to view Dropbox photos as desktop wallpaper in center mode, full screen, four picture montage, mosaic, collage, thumbnail, etc. If you want to view only one Dropbox photo for the time being, then you can also pause the photo slideshow. 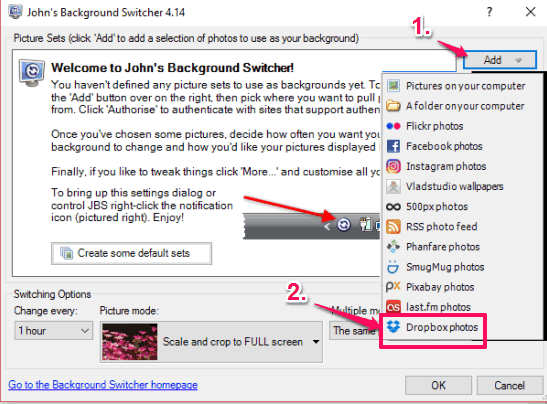 To show Dropbox photos as desktop wallpaper in Windows, I am gonna use a free software, named as “John’s Background Switcher“. Using this software, you can connect your Dropbox account with this software, select photo folder available in your Dropbox account, set time to change the wallpaper, picture mode, and leave this software running in the system tray. After that, it automatically shows Dropbox photos as desktop wallpaper on your PC. So without downloading Dropbox photos, you can choose any of your favorite photo folders from Dropbox and then use photos of that folder as desktop wallpaper. If the images are set to display in center mode, then it automatically fills the rest of the background color with some solid color that matches the image color. How To Show Dropbox Photos As Desktop Wallpaper In Windows? Step 1: Use this link to get its setup and install it. Step 2: On its interface, click the Add drop-down menu and you will see multiple options. Among those options, you have to click on Dropbox photos option. Step 3: A small authorization window will open. In that window, click the Authorise button. This will open Dropbox sign in page on your default browser. Log in to your Dropbox account and Allow this software to access your Dropbox account. Step 4: When the authorization is done, come back to its interface and press OK. Now you will see an Open Folder window is in front of you. In that window, you will see all your Dropbox folders. Select the picture folder and then press OK button. Step 5: You will come to the main interface of this software and see that Dropbox folder is selected. Now, set photo change time (10 seconds, 15 seconds, 1 minute, 5 minutes, etc.) and picture mode using the options available at the bottom left of its interface. 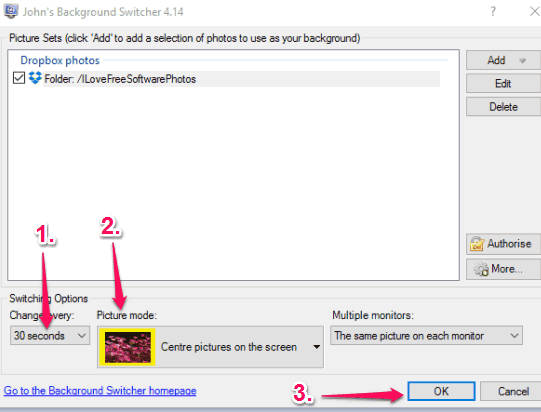 If you are using multiple monitors, then you can set if you want the same picture on each monitor, different pictures on each monitor, etc. Finally, you can press OK button and save the changes. The software runs silently in the system tray and shows Dropbox photos as desktop wallpaper. You can also access Settings to set some extra options. For example, you can enable the option to show photo date if available, use hotkeys to go to next and previous pictures, show calendar on desktop, etc. You can also check how to Automatically Change Windows Desktop Wallpaper To HD Artworks and How To Automatically Set Photos From Unsplash As Desktop Wallpaper. Earlier I thought it would be difficult to set Dropbox photos as desktop wallpaper in Windows. But I am happy to see that this software makes the entire process quite easy. There are many other desktop wallpaper changer software available, but adding Dropbox images to use as desktop wallpaper is not possible with them. Therefore, this software is handy. 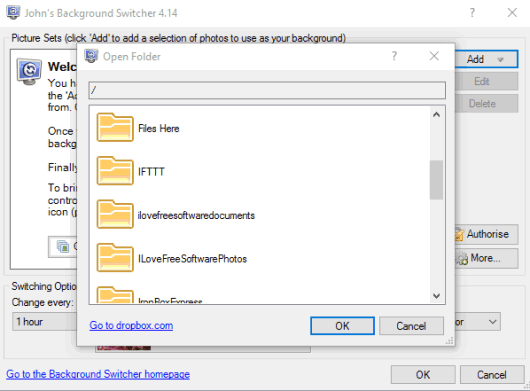 Just connect Dropbox with this software, select photo folder, change frequency, picture mode, and done.